“Someone must have been telling lies about Joseph K., for without having done anything wrong he was arrested one fine morning. His landlady’s cook, who always brought him his breakfast at eight o’clock, failed to appear on this occasion. That had never happened before”. Those were the words of Franz Kafka from his novel “The Trial”, published one year after his death. The novel, one of Kafka’s best-known works, even thought it was never completed, tells the story of a certain someone arrested and prosecuted by a remote, inaccessible authority and the nature of his crime is never revealed to either himself or the reader. In the beginning of the novel, a senior bank clerk known by the name of Joseph K., is arrested suddenly by unidentified agents for an unspecified crime. As the story unfolds, Joseph K. is summoned to court back and forth, between advocates, witnesses and bureaucratic procedures, and even though the idea is clear that there is a process against him, no charges are trumped against him, as he repeatedly visits the court and stands in the witness box pleading his case, not knowing exactly what it is that he is pleading. One of K.’s bank clients advises him to visit a man known as Titorelli, a painter from the court, who seems to have no connections within the system but demonstrates an acute understanding of the process taking place. What at the time was for Kafka a metaphor for things other than law – in the words of legal scholar Reza Banakar – while presenting an examination of a particular concept of law which operates as an integral part of the modern world, there is just so little of metaphor today in trials without accusations, without charges and above all, without justice. These kind of haphazard arrests and trials, no longer a novelistic gimmick or an exceptional event, have become an everyday event in the Middle East where mock trials are the most iconic manifestation of the counterrevolutionary efforts deployed by the dying regimes to hold onto power by any possible means, and nowhere else more than in Egypt, where the revolution of 2011 lapsed into a comatose state of confusion after the Supreme Council of the Armed Forces (SCAF) took over the country’s leadership from ousted president Hosni Mubarak, transforming Egypt into a de facto military dictatorship led by a military junta. Since the revolution, over ten thousand Egyptians have been subject to such trials, what is in numbers, several times more than those put to trial during the entire Mubarak era. That these arrests and trials have been made in compliance with the laws of the land – whatever those laws may be and whoever wrote them – is even less of a surprise, since it does not take too much familiarity with politics or history anywhere to be fully aware of the imminent divorce between law and justice in our times. Roger Berkowitz, a scholar of law and philosophy phrases this contemporary situation in the following terms: “For those of us living through the divorce of law from justice, the rules of law appear naked, stripped bare of any claim to a higher good. We may praise law for its legitimacy, its fairness, or its efficiency, but we do not love it for its justice. The sequestering of justice in the world beyond leaves this world prisoner to the whim of calculating bureaucrats, legislators, and judges. Clearly Egypt is nothing of a lawless country; in fact, the opposite is true: a thick forest of both archaic and modern legislation makes it possible for the world’s oldest state to come even close to deliver justice: The Egyptian constitution provides diversity of punishments for those critical of the regime or the state religion, but yet offers little justice to victims of a wide range of crimes perpetrated not only by other citizens but by the system of law and the government itself. Where Kafka might have been mistaken in describing the current state of affairs in Egypt is when he writes “That had never happened before”; since it is well known that the grievances in the Egyptian street that led to the uprising and subsequent revolution were not only economic, but also social and political. Widespread corruption, censorship, random imprisonment and a wide range of restrictions imposed on the Egyptian public sphere are not an innovation of the military junta, but rather deep-rooted traditions of authoritarian regimes in the Middle East, that in Egypt go back to the Egyptian revolution of 1952. Of course it is another paradox – among the many that plague life in the Arab world – that the revolution of Tahrir in 2011 would come to an apparent end when power was handed out to the army, in order to fix the results of half a century of injustice by the same institution – the military – that brought to an end the glorious era of Egyptian cosmopolitism during which Cairo was known as the Paris of the Orient, and musicians, intellectuals and businessmen flocked to the city looking for opportunities and inspiration. Egyptian writer Yahia Lababidi tells us in his book “Trial by Ink” about the contradictions of that “new” Egypt begot after the first revolution: “Much of the new morality is fanned by a kind of Islamic panic, quite foreign to the laid-back Egyptian character. It is the difference between a quiet confidence and a loud insecurity. By defiantly accentuating a superficial religiosity, contemporary Egyptians downplay their natural strengths and exaggerate their weaknesses.” Though apparently secular in nature, these pseudo-secular nationalist regimes of the Middle East profited infinitely by striking deals with the nascent religious fundamentalism that making claims to an ancient religious tradition, is in fact nowhere more at home than in the most irreligious and unspiritual radical fundamentalisms of modernity. Lababidi concludes by saying: “Yet it was not always so. Witness local film stars of a few decades ago – happily prancing around in minis and bikinis – or hear rueful stories from members of past generations to know how open-minded and cosmopolitan Egypt once was”. All of this was common knowledge before the uprising in 2011 and during, in which hundreds and thousands of people took to the streets in order to both restore Egypt to its former glory and create a new and different future for all Egyptians. After weeks and weeks of massive protests that demanded the resignation of long-time president Mubarak and the end of authoritarian rule, weeks during which hundreds of people were butchered at the hands of the military, in a surprising move, the army took the demonstrators’ side and helped topple the long-time dictator. A common saying was coined in the Egyptian street and proclaimed out loud – “The Army and the People Are One Hand”, which was followed by photographic footage of demonstrators sleeping on top of military tanks and soldiers defending private citizens from thugs, apparently sponsored by the dying regime. Did people know at the time that this would be the beginning of a military junta period rather than an age of democracy and freedom? Perhaps not. But there was one man, Maikel Nabil, who did know, and who did not hesitate to publicize his view in order to warn his fellow Egyptians that what had happened when power was turned over to the military wasn’t the end of a revolution but rather the hijacking and theft of the revolution itself on the part of a military council that was neither democratic nor opposed to the salient regime. Maikel Nabil Sanad, a 26-years-old blogger of Coptic origin, but self-proclaimed atheist and political activist, was arrested by the military police on March 28, 2011, from his home in Cairo and sentenced to three years imprisonment because of a blog post titled “The Army and the People Were Never One Hand” in which he described in detail the extensive number of violations committed against demonstrators and human rights activists even after the departure of Mubarak. Nabil was a controversial figure in the Egyptian scene of human rights because of his being one of the very few activists in the entire Arab world who advocated peace with the State of Israel and who in 2009 founded the movement “No to Compulsory Military Service”, declaring himself a conscientious objector, demanding to the exempted from military service. To be sure, human rights activist or not, his ideas were not welcome by the vast majority of Egyptians. His criticism of the army was mocked by many, but it was also the case that after his arrest, not only did many Egyptians – including activists – fail to demand his release but actually supported the decision of the military council on grounds that Nabil was a traitor and a Zionist because of his support for Israel. Unlike other activists arrested for a variety of reasons, Nabil’s plight did not make any headline at the time and the case fell into complete oblivion in the mind of average Egyptians. Arrested and put to trial just like Kafka’s Joseph K., Maikel Nabil knew – unlike K. – what he was being put to trial for and that he army had wanted to make an example of him because of his sharp criticism, using the always handy card of Israel that in the Middle East resounds beyond the borders of reason. Whenever something goes wrong at home or something is found to be rotten, it is always possible to blame Israel for something, deflect attention and champion the Palestinian cause selectively, only in order to further the regime’s own agendas. In the words of Nabil, written from prison, he knew he was signing his own death sentence when he wrote his blog post and he has courageously demonstrated that he has no intention to give in or offer apologies to the military rulers. Even though the silence on his case was deafening, his words became more and more accurate as the weeks of incarceration turned into months, and the military junta continued unmolested to trample the human rights of the entire Egyptian nation. The list of all the crimes committed by SCAF against Egypt are too long to be mentioned in one article or in a dozen, but they include virginity tests performed on women, over then thousand civilians put to military trials, almost monthly massacres, constant clamping down of protests and the most absolute failure to deliver justice to the hundreds of families that lost their sons and brothers and fathers in the course of the revolution, at the hands of the military, then under Mubarak’s orders. While Maikel Nabil and so many others remain in jail, ousted president Mubarak´s trial keeps being delayed and his aides, including those who murdered protesters, run free and were even allowed to run for office. His plight remained unheard for several months until August when he began a hunger strike that lasted over a hundred days, in order to demand his immediate and unconditional release. At the time, even at the threat of his imminent death and the fact that all his words had been corroborated against reality time and again, the Egyptian public remained silent and so did the vast majority of the international community. In Egypt, only a select number of activists – and I say select not without irony, because what was select about them was their absolute minority in Egypt – championed his release, in many cases, only in the name of liberalism and freedom, while still stressing the reasons for which they didn’t support Maikel’s cause. It became common amongst them to quote Voltaire saying, “I disapprove of what you say, but I will defend to the death your right to say it”. What was interesting here is not only that they disapproved of his ideas, but that they had confirmed many times over and over, that his analysis of the future of revolutionary Egypt under the military junta was completely accurate. Slowly the international community took an interest in his cause, especially after the very prominent blogger and activist Alaa Abd El Fattah was also arrested on similar charges and some human rights organizations in Europe and elsewhere began to demand the release not only of Alaa, but also of Maikel and so many others that to this day remain unknown outside Egypt, including another blogger, Ayman Mansour, who was sent to prison for insulting Islam on Facebook. For several months the possibility of his death as a cause of the extended strike became very real and at that, he was refused hospitalization by the military council and even once, was sent for psychiatric evaluation with the sole intention to declare him insane and keep him confined in a mental hospital, a well-known tactic from totalitarian regimes. To Maikel’s luck, a doctor at the mental facility intervened with the support of her superiors and prevented the military council to carry on with their plans. Nevertheless, nearly every month he was expected to be put to trial again and given a final verdict, but as in Kafka’s narrative, the verdict kept being delayed each time again and again on the ground of some bureaucratic procedure. After Maikel Nabil decided to end his hunger strike in December and was transferred to another prison, after being in solitary confinement, a momentum for his cause was finally reached and articles began to appear all over the world, even by very prominent writers and personalities, explaining to the world why it was so important to release the Egyptian blogger. Nevertheless, in purview of so many events happening in the Arab world now, including the never-ending crisis in Syria that has reached over 5000 dead, the threat of war between Iran and Israel, the humanitarian crisis in Yemen, no less than the complicated transitional politics of Egypt that is everything but transitional, the case of Maikel Nabil has been forgotten once again, even though he was the first political prisoner since the revolution – an irony in itself – someone who has demonstrated not only courage, but great determination and remarkable intellectual skills in his analyses not only of Egypt but of the situation in the Middle East at large, and who could contribute infinitely to the new Egypt, if that Egypt is going to be built once. Nabil wrote from prison in December 2011: “It’s beautiful that there are many people who started to speak out about me after long months of silence and ignoring, and it’s beautiful that many people care to know about me… But I think that people should care more for my thoughts than for my personality, because in the end I am confined because of my thoughts, not because of my personality. My thoughts are what I sacrifice for”. 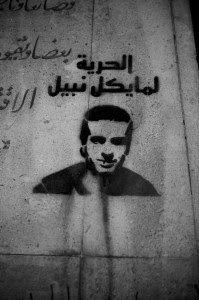 So many months after his arrest, a vast majority of people keep conveniently ignoring what Nabil wrote and said, and have sheltered themselves upon the cause of human rights in general, trying to escape from the sharp criticism of the imprisoned blogger that very few in the course of the Egyptian revolution have been willing to apply on themselves at all. In the meantime, human rights are still violated in Egypt on a daily basis and media constantly censored, foreign journalists harassed, the tourism industry suffering from record losses and in between, Marshall Tantawi, leader of the Supreme Council of the Armed Forces and now officially ruler of the country, has announced that celebrations will be held to commemorate the first anniversary of the Egyptian revolution. One cannot help but wonder what is it exactly that which is going to be celebrated when Maikel Nabil and many others remain in prison for nothing but their thoughts and criminals are still at large. Berwokitz was right; the law is nothing in itself today. In Egypt, however, it is even less than that, it is an instrument of tyranny whose only aim is not to deliver justice but to strip millions of people from their basic rights and to starve them out not only physically, but also emotionally and spiritually, only in order to prevent them from demanding what is theirs: The possibility to make decisions about their own destinies.